Did you know we don't just make Wedding Gowns, we offer a bespoke made to measure service for Mothers and Wedding guests too? We have a small sample range of dresses and jackets in store that show you the quality that we work to in tailoring. 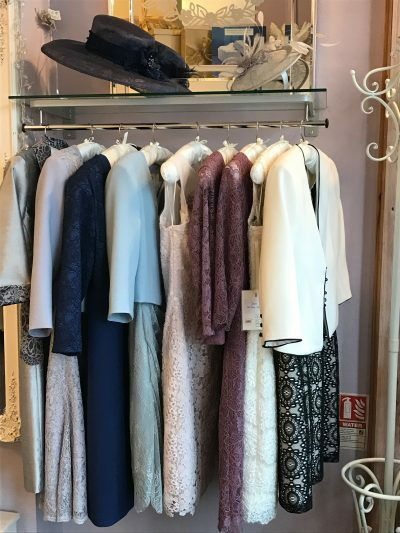 We can discuss with you the shape of the outfit that best suits your shape and we can source fabrics and colours to compliment your skin tone and co ordinate with the wedding party. A bespoke outfit is the best way to ensure you don't end up wearing the same dress as another guest! The price guide for this service is approx £350 for a dress to £700 for a dress and jacket, all made to measure for a perfect fit and no alterations necessary. We can also make matching fascinators or trim a hat that you bring in, with matching materials to complete your outfit.